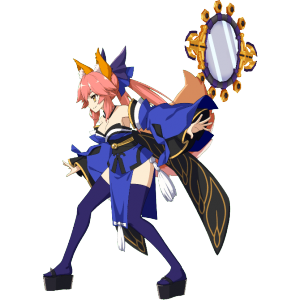 This article is for the 5★ , Tamamo-no-Mae. 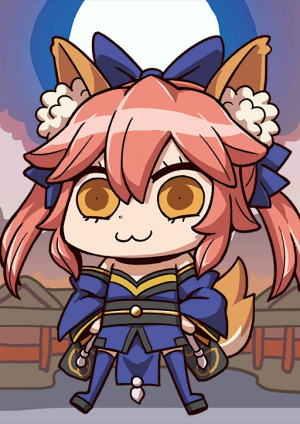 For 5★ , see Tamamo-no-Mae (Lancer) or for 4★ , see Tamamo Cat. High chance to reduce an enemy's NP Gauge by 1. Increase your DEF (3 turns). Greatly increase your DEF by 30% (1 turn). Increase your Arts Card effectiveness by 6%. Restore's HP to all allies. Overcharge: Increases all allies' NP gauge. 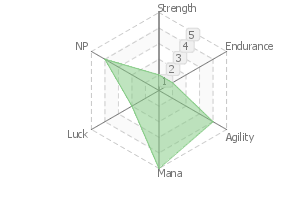 Increase Arts Card performance of all allies' by 15% while she's on the field. A shrine maiden who wanted nothing more but to be a good wife. She served Emperor Toba at the end of the Heian period and was known as the most beautiful woman of her day. Some say she's actually the Nine-Tail Demon Fox in disguise. Well, a lot happened and she was chased from the palace, then gave herself up to humans and stuff. Origin: Japanese mythology. One of the Three Great Demons. "Yes? I'm a fox, and a shrine maiden. Is that a problem?" Her desire to find a lover pours out of her. A totally Gyaru Servant, but really, all she ever wanted was to "devote herself to someone." Her childhood name was Mikuzume. She started serving in the palace at the age of 18. 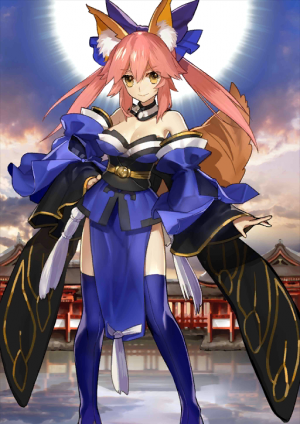 Later she changed her name to Tamamo-no-Mae and served directly under Emperor Toba. Due to her unparalleled beauty and her vast wisdom, she was adored by the Emperor. A Noble Phantasm in the shape of a mirror. This is the temporarily released form of a divine treasure called Tamamo Shizuishi. Normally this powerful treasure is capable of even reviving the dead, but she lacks the ability to draw that power out now. A spell to either acquire social status and wealth (for males), or love from those in power (for females). Allows the user to attain power, and even realize one's own time of death. 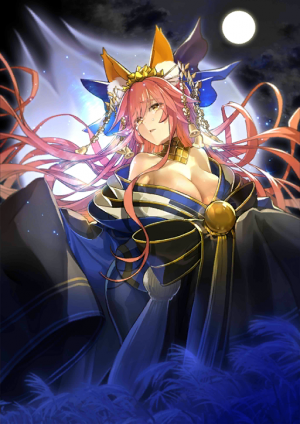 But since Tamamo was traumatized in the past, she doesn't really want to use this skill. 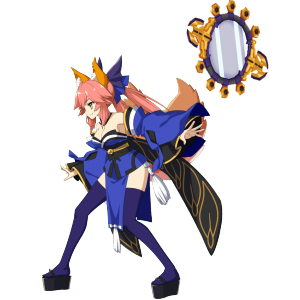 Tamamo's own version of the skill Item Construction. By one-sidedly announcing her marriage, she can cause a rain of blessings to fall, and any friendly-ish targets will be forced to give her presents to celebrate. An OP skill matching her personality! To repent her past sins, she cut off her tails and fell to the status of a one-tail fox. If she goes through another millennium of training, she might be able to become a nine-tail fox again. By the way, each of the tails she cut off has the exact same spiritual power and spiritual core as her. Even if she goes through an Ascension, rest assured, the most she will become is a three-tail. A good-wife-aspirant, extravagant miko shaman. In the deathbed of the Heian Period, this peerless beauty served the retired emperor Toba. It has been said that she is the disguised appearance of the nine-tailed fox Hakumen Kinmou. For a number of reasons, in the end she was chased away from the imperial court and, after having a major decisive battle with humans in the fields of Nasu, obediently let herself be exterminated, or something. A gal-type Servant who is overflowing with the desire of "Currently Recruiting a Sweetheart", in her core she desires to "devote herself to people". Her childhood name while alive was Mizukume. At 18 years old, she served in the imperial court and later came to work for retired emperor Toba. 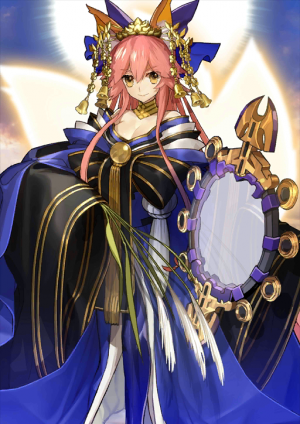 She became a court lady and called herself Tamamo-no-Mae. It has been said that she was favored by retired emperor Toba due her beautiful looks and extensive knowledge. Reflecting on her past misdeeds, she cut loose her own tails and fell into a one-tailed condition. By twisting her sacrum bone and once again undergoing thousands, ten thousands years of ascetic practices, she may turn back to a nine-tailed but... By the way the cut down tails are also endowed with the same spiritual power and spiritual core as herself. Be at ease, for even after reaching the limits of Ascension, she will only return to a three-tailed form. 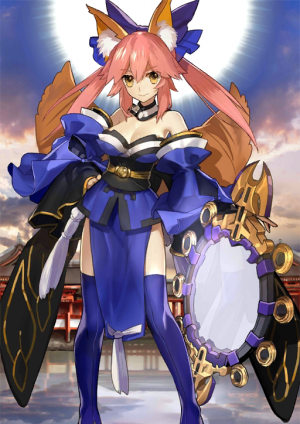 Tamamo-no-Mae was available for summoning temporarily during the Adventure of Singing Pumpkin Castle. With the release of London, she was permanently added to the summoning pool. She shares the exact HP values (at both minimum and maximum) with Zhuge Liang (Lord El-Melloi II). 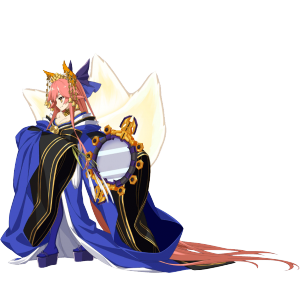 During her NP the song played is her theme from Fate/Extra, "Extra Life With Anyone She Wants"
This page was last modified on 25 April 2019, at 04:34.